Tea plantation in the western province of Rwanda. The global tea market is estimated to be worth about 38.2 billion U.S. dollars in 2016 and is projected to continue growing at 2.8% annually until 2020 . After coffee, tea is Rwanda's second most valuable export where agriculture accounts for one third of economic output . Tea productivity depends on a various factors such as weather, fertiliser and management practices. Hot dry conditions are generally detrimental for tea productivity and therefore daily rainfall and temperatures are important variables. A recent drought in Rwanda, claimed to be the worst in 60 years, has generated losses of up to 40% for some tea producers. Climate variability is already a concern for the agricultural sector. Uncertainty about the impact of future climate change and the frequency and severity of weather extremes such as droughts poses substantial challenges for policymakers. Information about the current climate relies on 30-year averages. Rwanda faces a unique challenge due to the genocide in 1994 and consequent disruption in its weather observation network between 1994 and 2009. Tea is unusual since unlike other agricultural crops, it is grown and produced continuously throughout the year. Whereas other crops are harvested once or twice a year, green tea leaves can be picked daily and brought to the factory to be weighed and processed. Rwanda produces high quality tea because the leaves grow relatively slowly in the country of a thousand hills where tea factories are currently situated at relatively high altitudes ranging from 1757m to 2357m above sea level. Our study of several tea factories in Rwanda found that using ground-based weather observations was problematic due to missing data, sensor failure, relatively large distances between stations and tea plantations and the existence of microclimates due to the hilly terrain . An alternative is to use satellite imagery as a means of estimating weather variables. Big data is driving innovation in the agriculture sector and the ability to measure both weather and productivity more precisely has great potential . Machine learning techniques were used for feature extraction and the identification of a parsimonious model. Alongside rainfall estimates, a number of additional satellite products were found to be relevant for predicting tea productivity such as surface, soil and root moisture content, vegetation greenness and the enhanced vegetation index. Performance of tea productivity forecasts using weather information at the factory station and satellite imagery. The performance improves with temporal aggregation and the satellite information provides superior performance. The forecast evaluation used the coefficient of determination to measure predictability. Three time scales were considered for aggregating productivity: daily, weekly and monthly. The results demonstrate that satellite information is superior to ground-based weather estimates for all three time scales and that predictability was highest for the monthly aggregated productivity. The temporal smoothing of productivity is expected to improve predictability since the specific hours and days worked by tea pickers become less relevant. 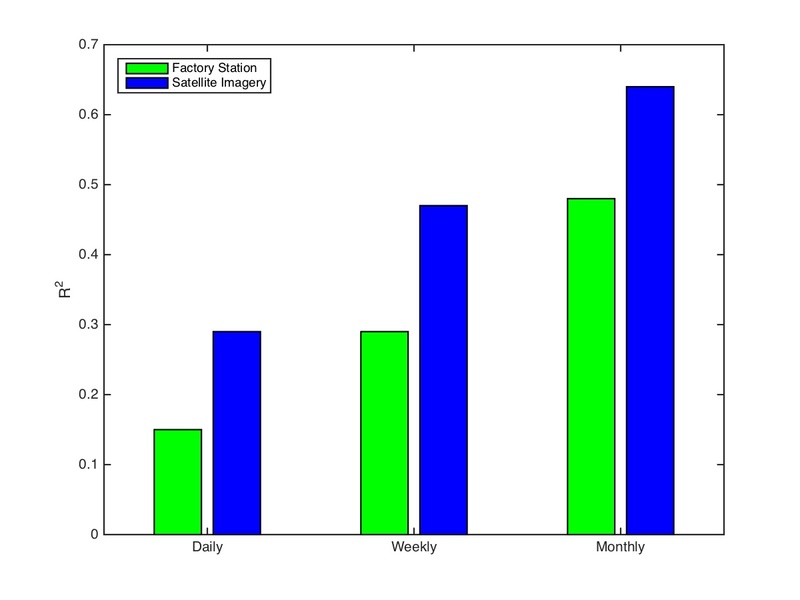 Monthly forecasts based on satellite imagery explained 64% of the variability on average. Satellite imagery outperforms local ground weather stations by 33%. The ability to forecast tea productivity using satellite imagery suggests that it should be possible to use similar machine learning approaches to predict the yield of a number of important crops such as maize, beans, rice and potatoes. Transparency Market Research (2016) "Tea Market - Global Industry Analysis, Trend, Size, Share and Forecast, 2014 - 2020". New York, US. Rwanda Development Board (2016). Kigali, Rwanda. McSharry, P.E., Swartz, T. & Spray, J. (2016). "Index based insurance for Rwandan tea". International Growth Centre, London, UK. Thomas, R. & McSharry, P.E. (2015). 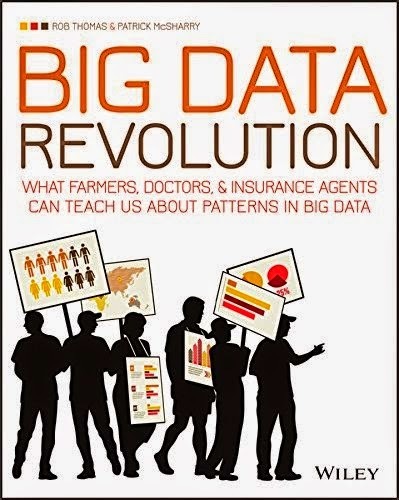 "Big Data Revolution". Wiley & Sons, London, UK.